Last week, my sisters and I sat down to make the menu for Thanksgiving dinner. A decade ago, if you'd asked me how many things I'd volunteer to make, I may have signed up for my mother's orange salad, which consists of cottage cheese, orange jell-o, mandarin oranges and cool-whip. That torch has passed to the baby of the family, I'm proud to say. 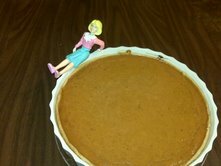 This year, I made sweet potato casserole (wicked good and not a marshmallow in sight! ), green beans sauteed with slivered almonds, stuffing, mashed potatoes (with cream and butter, of course), rolls and five pies. I have to say, I've found my space. I loved being in the kitchen all morning, making sure that everything was timed so that it all came out hot, at the same time, and without fear of botulism or salmonella. Perhaps the best was that everyone else was so happy to not have to cook that they were more than willing to entertain my own little crumb snatchers. My sister prepared the 24-pound turkey and transported it to my parents' house without incident, whisked some awesome gravy from drippings and roux and we all had a wonderful, stress-free holiday. For those of you who know my family, that in itself is nearly a miracle. At the end of the day, my sister and I were marvelling that we'd survived a holiday at which three of the four sisters were present, and nobody, I mean nobody leaked a single tear. I had an a-ha moment as I was hugging Myrtle good-bye...Marmy didn't spend a second in the kitchen! My love of cooking was discovered on my own, not because I was encouraged to stand next to my mom as she patiently watched me scoop flour and whisk eggs. Germs, messes and other mistakes could abound if sticky-handed children put their fingers in her pie. We knew that she would appreciate a big dinner that she didn't have to prepare or plan, but about ten years ago, she never would have let her kids take over the kitchen for a day and trust that all would be well in the end. So, this year, I'm thankful for the pharmaceutical company that developed Zoloft. Because controlled OCD is a beautiful thing. Oh, and that I was able to be in the loving clutches of my big ole family, instead of 3,000 miles away. Time flies when you're having fun...which is the only excuse I can think of for going this long without posting. I've been knitting up a storm*, taking long drives around the valley, making full dinners for the parentals and myself, watching the kids have a ball in the great outdoors and just enjoying being back in small-town USA. Did you know that people routinely smile and chat you up in grocery stores, on the street and just in general? I know! I'd almost forgotten as well. I love driving my dad's big ole pick-up truck, and love that when you're driving 60 miles an hour on the highway between my old stomping grounds and the big city, otherwise knows as L.A. Grande, that people will wave because they recognize your car. I love putting the boys in the double stroller every afternoon and getting out for a nice long walk down through the town. I love having a yard that they can run, and run, and run in every day. Seeing H's 'Californy Quail', for whom he tosses out cracked corn every day, and the deer that boldly jump the fence into the yard to clean up the extras after the quail have settled in for the night. I love that Charlie has started making all the barnyard noises because we're actually seeing barnyard animals everywhere we go. I love going out for beers with my friends and only spending $20 for a roaring good time. I love that this time is helping me make the mental transition back to rural America. Most likely J's job will not land us back in Portland as we'd hoped, which was really disappointing at first. What will I do without sushi restaurants, major movie theatres and an endless stream of entertainment possibilities right at my fingertips?! But the more I'm home and see the kids of my friends, and my friends themselves with the comfortable lives they're able to afford and enjoy, it's getting more and more palatable. Maybe even, gasp, something I'm looking forward to? Wherever we land, it will be an adjustment. After three years I feel like I'm settled. We have a routine, we have friends and we have our home. The next six months are going to go so quickly, and I'm realizing that what this time in Oregon has really given me is an appreciation for how much I've loved living in New England. Yes, there are many things about it that this Pac Northwesterner finds 'wicked retahded', but it is a great place to be, and it will be hard to leave. There. I said it. *So far, I've knit two of the Georgian Lace Cap, a baby lace cap, most of a pair of socks, part of a scarf, and I started on the Scandanavian stranded colorwork stockings from KnitPicks. Pictures to come when I can figure out how to make my camera work with my parents' computer, or when I get home...whichever comes first. I'm sitting in the condo overlooking Pearl Harbor in disbelief that it's already my last full day in sunny O'ahu. We've packed so much fun into such a short period of time, yet still managed to have a day where we did absolutely nothing but lay by the pool at the Hale Koa and have frothy drinks delivered one after another. Nothing like a liquid lunch to make you enjoy the sunshine even more. Squelching the guilt of having my parents get up with the kids super early every morning has been surprisingly easy, as I just have to think 'Would I rather be there or here at this moment?' Yeah, here. We've balanced physical activity with tourist attractions and laziness, making me deliciously tired every night. Because of the time difference, waking up at 7-8am every morning has felt absolutely decadent. 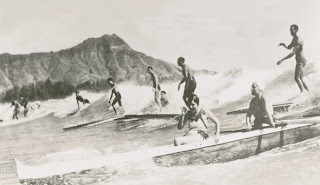 From sea kayaking in Kailua to hiking Diamond Head and Scuba diving and surfing in Waikiki, we came, we saw and, best of all, we learned a lot. I learned that shorty wetsuits are actually very easy to get on, and very easy to look totally awesome pretty ridiculous in. That filling up your BCD is scuba diving is pretty uncomfortable when you're not used to the sensation, and it's probably best that you don't have plate lunch to burp on. That surfing is frickin' hard work (well, the whole paddling back out to the waves bit) but so much fun...and you don't give a second thought to sharks because you're working so hard. That the sound of your own breathing underwater is the most relaxing white noise ever. That your dive master making a talking motion to you and pointing right under you means you're going to land on an eel...but he'll jerk you up by your tank if you give him a blank stare. That no matter how long you stand at the ready with your camera, you won't capture the random sea turtle poking their head out of the surf...if you want a picture, they have to come out of the water. That I have 'Tahitian hips' or so says the kayak rental guy when he learned that we never tipped over; I'm sure he says that to all the girls. That the long dark tunnel up to Diamond Head would end just before I thought I was going to have to turn around and have a panic attack. That a semi-private beach without a bathroom can lead to a 'situation', I just gave you a topic...tawk amongst youahselves. That the person in back of the kayak is supposed to steer, unless it's the wife in back and then the husband will do whatever he wants to in the front anyhow. That tandem kayaking is the way to go; that way, if you flip over or do anything else that causes a problem, you can blame your spouse. That you miss so much just playing in the water...put on a snorkel, mask and some fins and you'll be amazed at everything that's down there! That Hawaiian Shave Ice places aren't open after 7pm...no matter how many you go to. That shrimp shacks really are shacks...or old VW buses. That too much haupia (can you say Ted's Chocolate Haupia Pie? Yum!) makes you have to poopia...a lot. That the USS Arizona Memorial is incredibly moving, and should be on every one's list of things to see. That there is no such thing as too many frothy pool-side drinks. That the water can never be too blue, the sand too fine, or the sunset too beautiful. That you should do the things that push you outside your comfort zone, and do them with zest. I learned upon reflection that J and I would probably be 'that couple' were we ever to go on Amazing Race; loud and intense, and making those around us in the middle of a dispute that's, for the most part good-natured, slightly uncomfortable...but it would make for some damn good television and we love each other more at the end of every day. That absence really does make the heart grow fonder...I'm ready to see my babies again! Well, maybe after just one more day of being a pool rat. I'll see you tomorrow! Mwah! Today I did something I haven't done in over three years. I flew on an airplane all by myself, and it was fabulous. I noted several infants and toddlers with parents laden with toys, food, drink and other goods to occupy them for the journey ahead. What did I have? A small rollerbag, my purse and a smile on my face. The night before I'd been at a friend's house and spent an evening with former co-workers and my sisters-in-law who are now scattered about and pursuing their lives; a good time was had by all. As well as a lot of wine consumed...thank goodness for Starbucks! 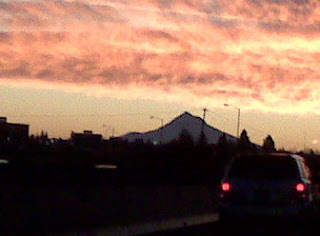 On the way to the airport, I snapped a shot of the sun coming up over Mt. Hood. A perfect Oregon morning, and a wonderful day to fly. As we boarded the plane I waited in line with all the other child-free people, and stowed my sole suitcase in the overhead compartment before taking my seat at the window, which would have otherwise been occupied by a car seat. As I settled in next to my stranger-seat-mate, I heard the whimpers of an unhappy baby a few rows back. "Somebody's not happy, and we haven't even started yet", grumbled stranger-seat-mate. I turned with a smile on my face and said "Well, then I guess you should be happy that it's not your problem, huh?" Ah, I finally found the shut-down for airplane small-talk. Calling someone out on their bitchiness. After 5.5 hours of looking out the window I couldn't stop thinking of the comedy sketch I'd recently seen, Everything's Amazing and Nobody's Happy (check it out on YouTube), as I gazed down the length of the 767's wing. How does this mass of steel become airborne? And how could you be experiencing that feat of science and engineering and be snarly? As I snapped aerial shots of the North Shore upon arrival, I stopped to take a picture of the wing as we made our descent. H and I had just talked about how the one part goes down, and the other parts go up, and it all helps to slow the plane as you descend and roll up to the gate. Alas, I guess I miss the little buggers after all. I posted about Evenflo Smart Steps over at Knitty Reviews.